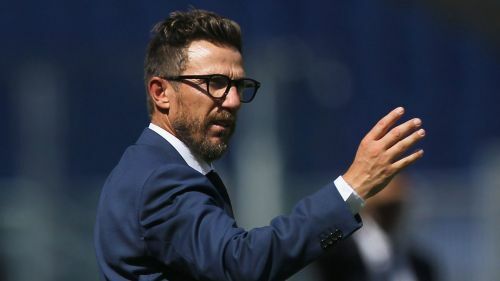 Eusebio Di Francesco admits he and Roma are going through "a tough time" but his sole focus is to guide the Giallorossi through to the Champions League quarter-finals. Roma were dealt a hugely damaging 3-0 derby defeat by rivals Lazio on Saturday, putting Di Francesco under pressure ahead of a European second leg against Porto in midweek. This has been pinpointed as a key game for the head coach, yet he is keen for Roma to take centre stage as they seek to defend a 2-1 lead in Portugal, setting aside his personal fortunes for the time being. "I would like to draw attention not to Di Francesco, but to Roma," he told a news conference. "My thoughts do not go to myself, but to my boys, for Roma to play a great game. It's not Di Francesco's game, but the players'. The important thing is that Roma go through. "I'm always thinking of the next game. After a positive run, we're having a tough time. The derby has damaged morale, but we must think about this game. This is a bit of a game of life or death." With Kostas Manolas injured, Roma's back-line struggled against Lazio, with Federico Fazio particularly exposed. But Di Francesco does not want to see individuals picked out and criticised at a key stage of the season, happy to instead shoulder the blame himself. He responded: "If we talk about individuals who made a mistake, we have to talk about the collective that approached the game very badly - including, first of all, the coach."